Plastic fabrication services include the design, manufacture and assembly of plastic parts for a range of applications. It can also include secondary services for plastic parts including welding, assembly, cutting, forming, bonding, drilling, lamination and more. Plastic fabricators often prefer using plastic materials because they are a cost-effective, lightweight and versatile solution for creating high quality parts for a wide range of industry applications. Part design, plastic material and production volume are all things you should consider before selecting a plastic fabrication service for your project. The simplicity or complexity of your design can impact tooling costs and may determine whether molding or extrusion is the most cost-effective and efficient solution. You will also need to consider whether your plastic part will be composed of single or multiple plastic materials, the functional purpose of the plastic in your product, and your product dimensions. Once a material and extrusion process is chosen, the final step is to determine whether your plastic part will require finishing or other secondary services. Figuring out your project budget ahead of time will help your plastic fabricator assist you to find the right process for your plastic parts, including the suggestion of material changes or other cost-saving measures. Crescent Plastics offers a range of custom fabrication services to give added value to our plastic manufacturing capabilities. Our automated fabrication processes can save you valuable time and money in your overall production process and result in more complete parts that require less additional processing on your end. We do more of the work now, so you don't have to later. Contact Crescent Plastics today to get us started on your custom fabrication project. We utilize fully-automated processes wherever possible in custom plastic fabrication to ensure superior precision, accuracy, and repeatability. Integrating "assembly line" methods into the part manufacturing process, our on-line fabrication capabilities provide consistent results that save time and labor by eliminating additional handling. Off-line fabrication is also performed in-house as dictated by our customers' volumes and requirements. By getting these jobs done quickly, we save our customers time. By performing them all in-house, we save our customers money. By doing them ourselves, we can better monitor the quality of the processes to ensure they meet or exceed customer expectations. Our expert engineering team will assess your part designs, and the associated manufacturing requirements, to determine where and how fabrication process can be integrated into production. Our fabrication services add value without significant additional cost and get your parts delivered quicker. Crescent plastics provides custom extruded plastic profiles manufactured to your print specifications. Plastic extrusion is a highly versatile process that allows for tight tolerances and is ideal for applications that require longer lengths or widths. 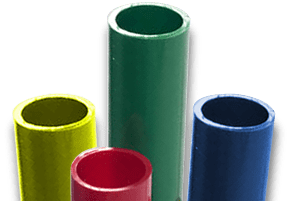 Our plastic extruded profiles are manufactured using a range of engineering thermoplastics and commodity thermoplastics, with specialty plastics available upon request. 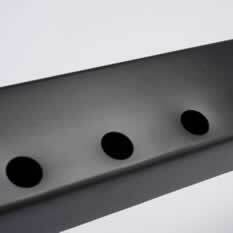 Custom extruded plastic finishes are used to create a unique, high end look for plastic extrusions. Specialty finishes are an excellent alternative to using more expensive materials and can be used to give your plastic extrusions a range of finishes including simulated metallic and wood grain finishes or to create a high gloss finish. Custom foam profiles for thermoplastic extrusions are used for applications requiring lightweight parts without sacrificing strength and durability. Foam plastic extrusions are an inexpensive alternative to standard thermoplastic extrusion and are a great substitute for wood products because it is lightweight, resists rot, is insect resistant and can be cut and shaped like wood. Thermoplastic coextrusions combine two or more thermoplastic materials to achieve characteristics and performance that can’t be achieved with a single plastic material. Custom plastic coextrusions are used to create flexible or rigid materials, join different colored materials and create flexible hinges to join two rigid materials. Crescent Plastics performs a range of custom fabrication services at our Evansville, Indiana facility. In addition to our plastic extrusion services we provide inventory management programs and in-house engineering, design and tooling services. 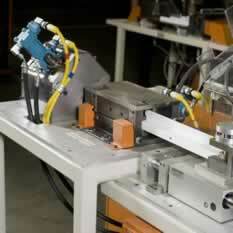 Request a quote for the custom fabricated plastic extrusions you need.